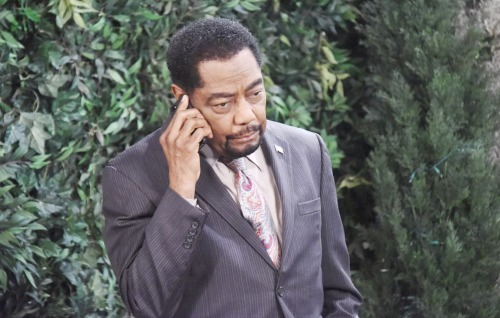 Days of Our Lives (DOOL) spoilers for Tuesday, October 3, tease that Abe (James Reynolds) will make a big decision. He’s got two great candidates for police commissioner, but he only needs one. Abe will ultimately decide that Hope (Kristian Alfonso) has a slight edge over Rafe (Galen Gering). He’ll announce that Hope scored the position, so Rafe will have to deal with that. Of course, things will also be tricky for Hope. In addition to bossing Rafe around, she’ll have to reprimand JJ (Casey Moss). 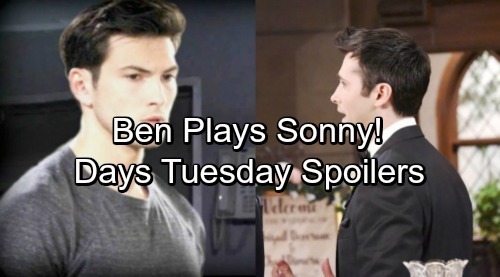 DOOL fans know that Ben’s (Robert Scott Wilson) escape has thrown everyone for a loop. JJ has been particularly agitated at the police station and his anger is only going to grow stronger. Days of Our Lives spoilers state that JJ will lose it in Tuesday’s episode. It appears JJ will have a violent outburst and that’s not good news for his career. No one can blame JJ for being upset, but physically attacking Ben is unacceptable. Hope will have no choice but to suspend JJ later this week. In the meantime, Sonny (Freddie Smith) will try to learn the truth. He’ll grill Ben about how Will (Chandler Massey) could possibly be alive. Unfortunately, Ben will play games and leave out details. He’ll reiterate that Will survived, but he won’t have a clue where the victim is now. If Sonny wants to locate Will, he’ll have to figure out another way to make it happen. Thankfully, Paul (Doug Davidson) will help with a new plan. Days spoilers reveal that Paul and Sonny will do some brainstorming. They’ll determine that exhuming Will’s body might get them the answers they’re looking for. Naturally, that strategy will come with some snags. They’ll have to do even more brainstorming once legal issues emerge. Other Days spoilers say Kate (Lauren Koslow) and Andre’s (Thaao Penghlis) relationship will take an unexpected turn. Will they get a taste of true romance? Their marriage has been an arrangement so far, but maybe changes are brewing. Perhaps Andre and Kate will share a kiss or some other type of tender moment. It sounds like some exciting scenes are in the works. We’ll give you updates as other Days of Our Lives info comes in. Stay tuned to DOOL and don’t forget to check CDL often for the latest Days of Our Lives spoilers, updates and news.